Well it seems the little battery powered lights I orginally put in the playhouse just are not enough. So I needed to add some additional light. I needed something my daughter could turn off easily. So we found a lamp on clearance and got rid of the (H.M.) shade and bought something a little nicer. 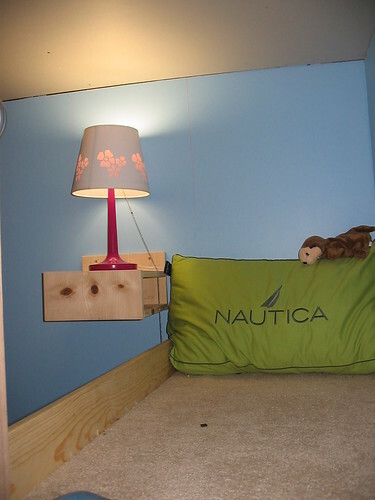 A simple shelf bolted next to her loft with a place for some books, some Liquid Nail to attach the lamp and some extension chain added to the original in order to allow her to turn it on from the lower part of the playhouse. She will see it in little bit when she gets home. I am sure though she will be quite happy. Thanks Dennis. She was quite happy and is looking forward to some reading time for herself.